Cancer takes more children’s lives than any other disease in the U.S., and for those who survive, their lives are changed forever. As the largest private funder of childhood cancer research grants, the St. Baldrick’s Foundation is leading the charge to take childhood back from cancer. The St. Baldrick’s Foundation is known for their signature head-shaving events where volunteers get bald to raise money for childhood cancer research. Because the Foundation was founded on St. Patrick’s Day in 2000, a large majority of events take place during March. With 600 events slated for this “peak” season, the St. Baldrick’s team realized it would be a challenge to create a personalized media approach for each one. The team decided to scale back outreach to the outlets and influencers representing key markets only, however this still involved a hefty number of contacts. “Our goal was to target the top 20 designated market areas for our Foundation,” said Traci Shirk, Director of Media & Storytelling. 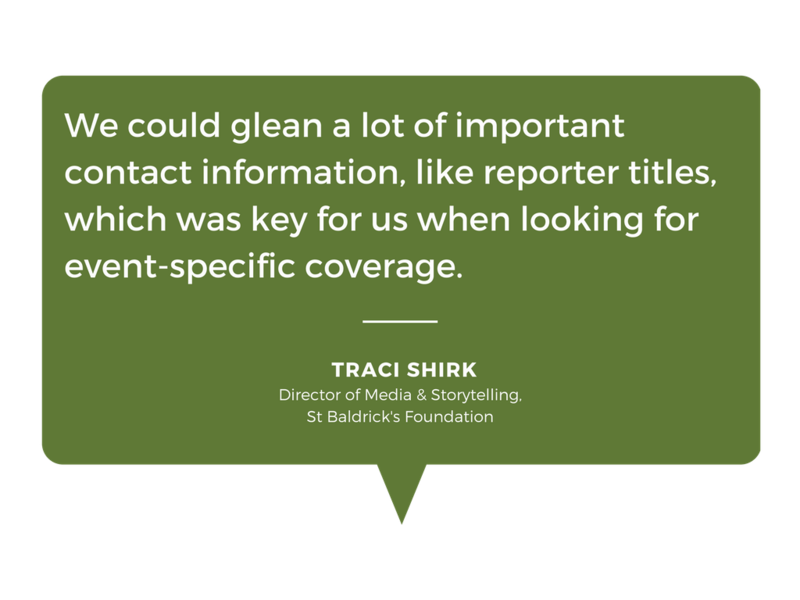 St. Baldrick’s PR strategy was divided into three parts: pre-event, day of event, and post-event coverage, creating new angles for competing media. “We pushed for same day coverage last year, so it was really important that we could maximize awareness with additional earned media opportunities,” said Shirk. The Foundation turned to Cision for help reaching key print and broadcast media contacts in specific markets across the country, all throughout the month of March. They chose the Cision Comms Cloud ™ platform for it’s all-in-one ability to target, distribute, monitor and report on their campaign. 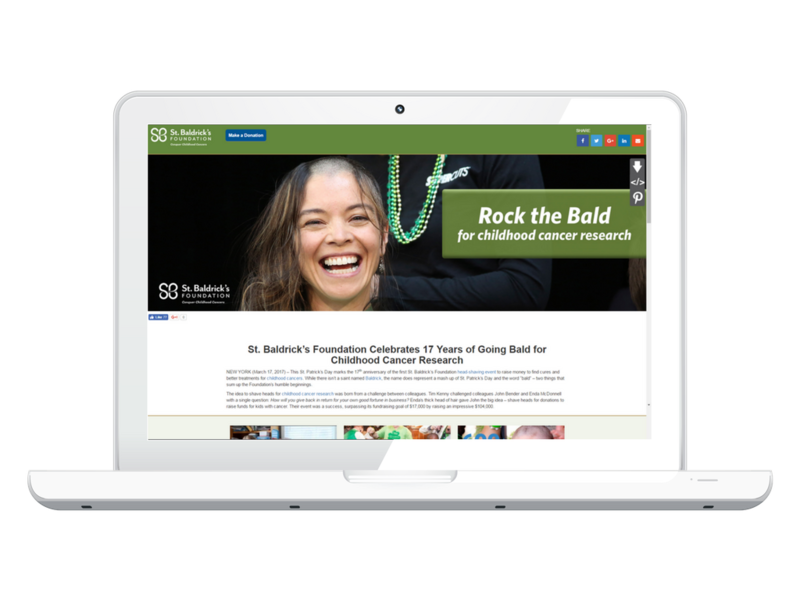 The St. Baldrick’s team began their work within the platform’s media database feature, creating media lists. “The keywords function helped us ensure that we were pulling the right kind of media contacts — those that would be interested in our events and overall strategy,” said Shirk. The St. Baldrick’s team strongly recommends taking the time to pull hyper-targeted media lists for the story you plan to tell. Once media lists were built and exported, the team sent out media alerts to relevant contacts a week ahead of an event. Follow-ups were sent out to print media three days later and to broadcast media two days before the scheduled event. Mid-way through the month, St. Baldrick’s leveraged Cision’s multimedia distribution capabilities, powered by PRNewswire, to put out a multichannel news release (MNR) highlighting the rich history of its head-shaving events. The MNR also included the Foundation’s “Rock the Bald” tagline, several video and high-resolution images supporting its efforts, and described how childhood cancer patients have benefited from these fundraising events. Using the Cision Comms Cloud analytics feature, the Foundation tracked impression numbers that that were later shared with the internal PR team and Foundation board members. ”We could easily chart out all of our news coverage and pinpoint specific events where spikes in coverage occurred,” said Shirk. Compared to March 2016, St. Baldrick’s 2017 campaign saw a 78 per cent increase in media impressions. “We are very proud of the coverage we received. Our goal was set for a 5 percent growth, so these results were incredible to see,” said Shirk. Additionally, the Cision Comms Cloud platform enabled the Foundation to track and export data on monthly unique visitors to the news stories published online and receive the “news vs ad value” on coverage. “It was nice to have these tangible values readily available and to be able to provide that type of information to leadership,” said Shirk. St. Baldrick’s was beyond satisfied with the turnaround and design elements of its MNR as well. “It was great to work with such a dedicated and unified team,” said Shirk. The Foundation’s MNR was viewed over 25,000 times, with over 75,000 views of included multimedia assets. In terms of social engagement, the MNR was shared hundreds of times and drove traffic to St. Baldrick’s donations page. St. Baldrick’s is gearing up for campaigns connected with Childhood Cancer Awareness Month in September. The Foundation is always looking for volunteers to help shares its mission and messages.